Posted: Fri Feb 17, 2012 8:21 am Post subject: Should Nefertiti be Chetite? I brought this up on another thread, but thought it might be best to discuss on a separate thread. I found this somewhere on internet. I could not work out who the writer was, but this a quote from what I found. "To answer that question we first have to correct the Egyptologist's false transcription of Nefertiti's name, originally rendered as Nofretete and now given in "neo-Egyptology" as Nefertiti. Both versions are hopelessly wrong.The correct transcription of the hieroglyphic name of Nefertiti, as we have discovered, is in fact Chetite, i.e. the name means the Hittite Queen, a name which makes sense since at this time there is a flurry of letter exchanges to and from this region, the so-called "Amarna Letters"Explanation: the hieroglypgh NFR as in NEFERtiti means "breath in the throat", so it is not meant to write NFR out as part of the name, but rather to render it as a "rasping throaty breath" sound.)" (1) Is it possible that Nefertiti was a mistranslated word that meant 'Hittite Queen'? (2) Could the Mitanni King's daughter, Tadukhipa, be of a Hittite Ruling Class in Mitanni? Like the Greek Ptolemies or the Norman Kings of Scotland? (3) Could Kiya be the Hittite Queen's real name? Posted: Fri Feb 17, 2012 11:19 am Post subject: Re: Should Nefertiti be Chetite? For this I would like to see the document. If someone makes a statement like this he should be able to explain it clearly to others?! I will need to go have another look. I think whoever posted the comments was saying the glyph (? hope that's right) for Nephertiti should read Chetite. There were two different things I found while wandering aimlessly about the internet. It caught my attention because of the old idea that Tadukhipa may have been Kiya or Nefertiti (or both). So when I saw Chetite as an alternative for Nefertiti, and Chetite meaning the "Hittite Queen", I kind of pricked up my ears. What would it mean for Egyptogology if we had a "Tadukhipa (Kiwa) the Hittite Queen"? Anyhow, I'll try to look further. I was hoping someone here was already onto the possibility and could confirm if it was feasible or not. Kiya and Nefertiti cannot be the same woman. The former's titulary gave her the style 'Great Beloved Wife' of Akhenaten embelished with a number of HIS titles. Nefertiti on the other hand had a long string of honorifics in addition to the traditional 'King's Chief Wife, Lady of Upper and Lower Egypt'. Kiya also had her own properties, including Maru Aten and a Sunshade. Her iconography was also very different from Nefertiti's. Can a titulary ever change? Hi guys, I have copied the stuff below from a blog. I don't know who the translator/thorist is. But is what is being offered below feasible or not? as in German "Mach 1, ich". NFR - an impossible never-existent "phoneme". as if we would now write song as son-nasal. now also available in English as Hieroglyphics). and NOT the lungs and windpipe. showed two opening pipes of the nose. Their first hunch was right as to sound. Indeed, the symbol means "nasalized breath"
nfrt [misread ! as ntfr] for "windpipe" in evidence. where SIRDI is actually the locative grammatical form. 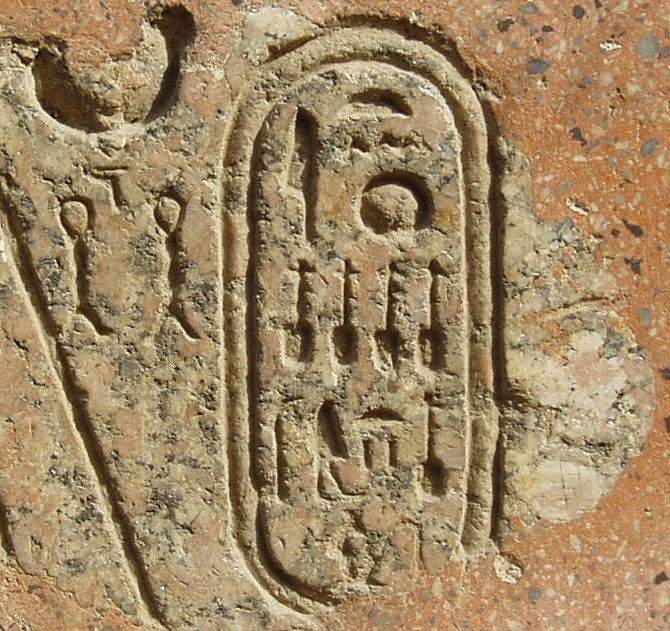 The hieroglyph today transcribed as "3"
as some Egyptologists have suggested. as his wife and he did so by force. She was the HITTITE QUEEN. Sorry the pictures did not copy. If you go to LEXILINE - NOFRETETE you'll view them there. And what about the cuneiform versions "Nafteta" (Nefertari) and "Napkhuriya" (Neferkheperure)? Yes, Robson, and what you're getting at is...? Sure. Sometimes titles are added sometimes lesser ones left out. What NEVER happens is that major titles like Chief Wife and Lady of the Two Lands are replaced by a lesser one like 'Great Beloved Wife'. Posted: Sat Feb 18, 2012 7:59 pm Post subject: Re: Should Nefertiti be Chetite? The article was written by Andis Kaulins, who is a self professed "law-trained expert in the history of civilization who examines the alleged knowledge of mainstream historical science from the standpoint of evidence." I recall him from Usenet days where he posted some of the most ridiculous arguments that Egyptian was in fact an Indo-European language (drawing mainly upon Latvian to make connections (!)). I believe he is a "one language" theorist, albeit not a very good one. Do a Google Groups search on "Andis Kaulins" and "Egypt" or "Egyptian" and you'll see what I mean. In short, Kaulins has no support for these contentions. Thanks neseret. I am no expert on these things, but I thought the text I pasted here seemed a bit ambiguous. Nonetheless, the contention that Nefertiti might translate somehow as "Hittite Queen" was tantalising. I'm interested to know what the current consensus amongst Egyptologists is as to Nefertiti's racial background. And what does "Nefertiti" translate as in English. Simply take: completely absurd. Even if there could be found in language research notes (which are not, to my knowledge) this nothing changes on the meaning / translation. We know absolutely nothing about Nefertiti's background, racial or otherwise. We can eliminate the possibility she was a member of the royal family as she never used the 'King's Daughter' or 'King's Sister' titles. There seems no good reason not to assume she was a native Egyptian, probably of high if not royal rank but we may never know the details. ... And what does "Nefertiti" translate as in English. "Nefer-ti-iti (+ determinativ Gardiner B7; Queen with diadem and flower) Nefer-neferu-Iten" = "The beauty has come (determinativ) Nice is the beauty of the Aton".